Britain's double world champion James Guy claimed his fourth gold medal of the week with victory in the 200m freestyle at the World Cup in Doha. The 19-year-old, who won the 200m and 400m in the previous round, and 400m freestyle gold on Friday, recorded a time of one minute 46.60 seconds. The GB team have now taken their total of medals over the two-day round to 12. 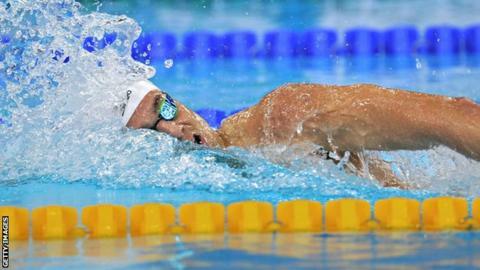 World champion Adam Peaty won silver in the 100m breaststroke, while Ross Murdoch and Jazz Carlin won bronze. Guy saw off Serbian Velimir Stjepanovic, with Jeremy Stravius of France third in 1:47.10. Britain's Robert Renwick was fifth in 1:49.24. Peaty clocked 59.28 seconds but was beaten by South African Cameron van der Burgh, who managed a time of 59.05, with Murdoch third in 1:00.52. Carlin recorded 4:07.27 in the women's 400m freestyle, won by New Zealand's Lauren Boyle in 4:04.26. Harriet Cooper (1:00.95) won bronze in the 100m backstroke and Luke Greenbank (1:58.68) also took bronze in the 200m backstroke.